Fermentation Vessels, also known as fermenters or FVs (and occasionally spelled fermentors), are the tanks, barrels, or other vessels where wort is held as it ferments into beer. Fermentation vessels have always been an essential part of even the humblest home-based brewery. They have been almost infinitely varied over time; almost anything that can hold liquid can be a potential fermenter. That said, the technology used for fermentation vessels has progressed considerably during the past 50 years. Historically, the development of fermentation vessels has very closely reflected the development of brewing methods and technology. The first beers were probably fermented in animal-skin pouches and carved wooden bowls. Starting in the early Sumerian and Egyptian civilizations (circa 4000 bc), from whence we have the first written records of brewing, the vessels used were ceramic amphora-like jars, probably up to a few hundred liters in size. These ceramic jars remained the fermentation and storage vessels for most beers (and also wines) for thousands of years. The next process is that of fermentation, which is carried on in a splendid room below, the floor of which is constructed entirely of slate. It is known as the “Havelock Room,” having been built at the time of the Indian Mutiny, and is shaped like the letter L with dimensions of 210 ft. and 132 ft. Here are contained fermenting vessels of slate and wood, each provided with a copper parachute for skimming yeast, communicating with the yeast tanks below. Each of the vessels holds from 120 to 190 barrels and contains an attemporator to raise or lower the temperature of the gyle at pleasure. This contrivance consists of a series of pipes fixed within the tun and having its inlet and outlet on the outside; by this means it is possible to run hot or cold water through the pipes at any hour. Active fermentations give off considerable heat, and fermentation temperatures can rapidly rise to a point where flavors and yeast health are adversely affected. The ability to cool fermenting beer was therefore important, especially during the warm summer months. The introduction of mild steel tanks coincided with the spreading use of industrial “artificial” refrigeration. First introduced at Germany’s Spaten Brewery in 1871, artificial refrigeration allowed fermentation vessels to be cooled by means other than the “natural” cooling achieved by digging deep fermentation cellars. These cellars had been cooled by vast quantities of ice cut out of rivers and lakes in winter and then placed over the cellar ceilings and below cellar floors. In the early days of refrigeration, cooling of fermentation vessels was achieved either by circulating refrigerated air in the fermentation cellars or by circulating cooled water or brine through metal coils inside the tanks. Normally the coils were made of copper or brass because these materials both conduct temperature efficiently and are not corroded to a major extent by wort or beer. The cooling coils would be placed along the sides or the bottoms of the fermentation vessels. By manually opening and closing the valves on the cooling coils, it was possible to rapidly chill beer, even during active fermentation. However, this method remained primitive and the temperature from vessel to vessel could vary greatly because the tanks were both open and uninsulated. Around the turn of the 20th century, rapid industrialization brought the widespread use of mild steel for all types of construction. Mild steel became the preferred material for building fermentation vessels. Because mild steel is very susceptible to corrosion by acidic liquids such as beer, direct contact with beer would cause the vessels to rust, giving the beer a notable metallic flavor and aroma. Thus, mild steel tanks had to be lined, and the preferred materials for this were enamel, glass, and later epoxy-type polymer materials. As long as the enamel or glass lining stayed intact, this was a perfectly sanitary and easy-to-clean inner tank surface. However, both enamel and glass are very brittle materials that eventual start to chip and crack, as does epoxy. Many brewery operations remained manual, including tank cleaning, and men had to enter these vessels and hand scrub them after every use. The linings were easily damaged but very difficult to repair. One thing was improving; although open fermentation was still practiced by some large American breweries into the 1970s, the norm in the United States slowly transitioned to completely closed fermentation. This made fermentation more sanitary and eased the collection and reuse of carbon dioxide created by the yeast. Around 1920, aluminum became affordable, and many breweries started installing fermentation tanks made of this much lighter metal. Aluminum had the huge advantage of being resistant to corrosion by wort and beer and could therefore be used without having to apply a brittle inner lining. One major disadvantage of aluminum, however, is that it is corroded by caustic soda (sodium hydroxide), which has for many decades been the preferred detergent for cleaning brewery equipment. Soon after the introduction of aluminum, stainless steel was introduced as a construction material on an industrial scale. This material offered many advantages when used in breweries in general and to this day is the undisputed first choice of material for constructing fermentation vessels. Also, piping, pumps, valves, and almost all other brewery equipment that comes into direct contact with beer are made of stainless steel. Until the 1960s, whether constructed from mild steel, aluminium, or stainless steel, most fermenters were cylindrical in shape and positioned horizontally. Usually they were stacked in several layers in the fermentation cellars, and it was uncommon to individually insulate the tanks because this was relatively expensive. For this reason, all fermentation vessels were used for primary fermentation only, so when active fermentation had finished, the beer would be moved by means of pumps and hoses to another tank in a separate cellar for the final maturation. Bottom-fermented (lager) beers would be placed for extended periods of time at low temperatures in the lagering cellars, whereas ales would be usually be transferred into a third cellar full of storage or racking tanks before being packaged. 1. They eliminate the need to move beer while in process, which is a huge advantage with respect to beer quality, process times, space utilization, and production economy. 2. Cleaning, sanitization, and microbiological control are far superior in cylindroconical tanks compared with older tank designs. 3. They can be individually and affordably insulated. 4. The degree of automation required in larger, modern breweries is much easier and less expensive than with older tank designs. 5. Collection of CO2 during primary fermentation for regeneration (and reuse/sale) is easy in cylindroconical tanks as opposed to the old open fermenters. 6. Cropping yeast is efficient, more selective, and more sanitary in cylindroconical tanks than in the older tank types. Interestingly, the cylindroconical tank has roots back to patents dating from 1908 and 1927, but the revolution in stainless steel fabrication was necessary to make the manufacture and use of such tanks practical. The proliferation of cylindroconical tanks began in Ireland in the early 1960s, where vertical (i.e., cylindrical tanks standing upright) stainless steel tanks of up to 11,500 hl (9798 US bbl) were in use. In 1965 the Japanese brewery Asahi patented a large vertical tank with a sloped bottom, allowing the yeast to be harvested from the low side. See asahi breweries. The first large-scale brewery to install large numbers of cylindroconical tanks was the Rainier brewery in Seattle, Washington, around 1970. These tanks, dubbed Rainier tanks, did have a conical bottom, but with a very shallow cone angle of only 25°. Soon after, it was discovered that a steeper cone angle (70° is the modern standard) gave a more convenient cropping of the yeast that settled in the cone bottom after fermentation. Further evolution and development of the technology of cylindroconical tanks focused on the number and placement of cooling jackets. Cooling jackets are hollow “belts” welded onto the outer surface (but inside the layer of insulation and outer cladding) of the tank and through which coolant (either glycol at subfreezing temperatures or direct expanding ammonia) can be circulated, thus cooling the contents of the tank. The placement and size of cooling jackets are critical to ensure the optimal movement and mixing of the beer during fermentation, thus ensuring the homogeneity that is particularly important in large tanks. During fermentation, the evolution of CO2 can create powerful currents in the fermenting beer. When jackets toward the top of the tank are cooled, the cooled liquid drops toward the bottom of the tank. At the same time, beer toward the bottom of the tank, warmed by its own fermentation, rises toward the top of the tank, only to be cooled again. This action helps create a circulation and mixing of the liquid, promoting faster, healthier, more complete fermentations. The overall geometry of tanks was also being explored in the 1970s and 1980s, resulting in taller and slimmer cylindroconical tanks, which saved floor space. However, it was soon found that once these so-called rocket tanks (in reference to their appearance) exceeded a height-to-diameter ratio of 5:1, good mixing could not be achieved and the yeast suffered from excessive hydrostatic pressure. Thus, today cylindroconical tanks are generally built with height-to-diameter ratios between 1:1 and 5:1. Modern cylindroconical tanks have more than one cooling jacket. This serves two purposes: first, to give the aforementioned optimal thermal movement of the beer during fermentation, and second, to allow the brewer to operate the tank at less than full capacity. A cylindroconical tank will also have a “cleaning device” permanently installed in the top, allowing for easy and automated internal washing of the tank. See cleaning in place (cip). Further, there may be more than one outlet from the tank bottom, allowing the brewer to draw off beer from the tank without inclusion of yeast that has settled in the bottom of the cone. Cylindroconical tanks were, from their introduction, well suited for being placed outdoors, thus saving space and building costs for larger breweries. Outside tanks are situated in so-called tank farms, where they are placed very closed to each other. This is made possible by the fact that no manual operations or servicing of the tanks take place in the tank farm itself. Rather, all piping to and from the tanks comes from the tank farm and through an adjacent wall to the beer-processing area inside the brewery. All automatic pumps, valves, or swing arms that need to be operated when using the tanks are placed here, largely eliminating the need for long hoses. The most modern breweries still use cylindroconical tanks. The next step in process development could be the introduction of continuous fermentation with immobilized yeast. The most recent developments in the technology of these tanks involve what one could call “the accessories” of the tanks in the sense of mechanical mixing (recirculation by pumping from the bottom to the top) of the fermenting beer, as well as advanced control systems that automatically measure and control the progress of the fermentation. See continuous fermentation and immobilized yeast reactor. Not all of the traditional tank types have vanished with the introduction of the cylindroconical tank. 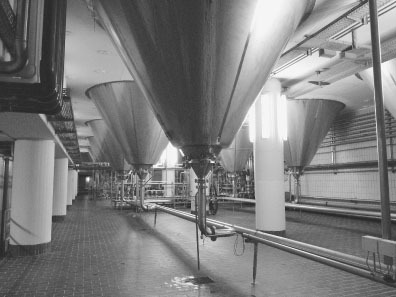 The requirements of the process involved in brewing traditional English ales have made many large breweries stick to the traditional geometry of square tanks with a “penetrable ceiling,” through which the traditional top-fermenting yeasts will accumulate at the end of primary fermentation and from where the yeast can be automatically harvested by a combination of valves and jets. This type of tank is called “Yorkshire Square,” referring to its shape and the place where they were invented and became widespread during the 20th century. Modern Yorkshire squares can be as large in volume as cylindroconicals and are also closed and fitted with CIP facilities, thus making them just as easy to automate as cylindroconicals. But because they are more complex, they are also expensive in terms of investment, they take up more space, and they cannot normally be placed outdoors. Many British breweries maintain the tradition of open fermentation. They feel strongly that the method has positive effects on yeast health and beer flavor. In Bavaria, open fermentation is sometimes used in the production of weissbier and occasionally for lager. Many brewers there believe that open fermentation tends to create a more intense aroma profile in weissbier than does closed fermentation. Marston’s Brewery of Burton-on-Trent, England, is known for having championed the once-common Burton Union system, where fermentation takes place in oak vats and expelled yeast travels between them in open troughs. It remains quite a thing to see, and Marston’s brewers claim that the flavor of their flagship beer would not be the same without it. See also burton union system, fermentation, and yorkshire square. Hough, J. S., D. E. Briggs, R. Stevens and T. W Young.. Malting and brewing science, 2nd ed. Cambridge, UK: Cambridge University Press, 1982. Kunze, Wolfgang. Technology brewing and malting, 3rd international ed. Berlin: VLB Berlin, 2004. University of London, Institute of Historical Research. A history of the county of Middlesex, Vol 2. Oxford, UK: Oxford University Press, 1911. Digitized October 12, 2010.